Both my children recently had appointments at the dentists office. I was so proud of them for having no cavities, but I was told that both of them needed to spend a little more time brushing certain areas of their teeth. But how do I make sure that they are brushing all the right spots without doing it myself? “BrushyBall – The Toothbrush Coach” is a fun product that encourages children to brush their teeth by turning a mundane task into a follow-the-leader game! My children can’t wait to brush their teeth at night now. They named their “BrushyBall” Elmer, and he guides them through the entire process of correctly brushing their teeth. It takes two minutes to brush your teeth properly, this can seem like forever when you are just 4 and 6 years old! 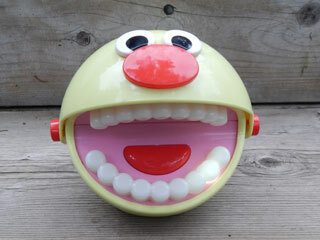 “BrushyBall” has a mouth that opens and closes. The first thing your child does is flip the head back and the “BrushyBall” begins to speak. He speaks for two minutes as his teeth light up in six sections. He talks your children through the entire process of brushing all of their teeth and tooth surfaces with simple instructions and a guided light. My daughter says that the “BrushyBall” helps her know which teeth to brush rather than just randomly choosing teeth to clean. There are three settings – Solo Music, English and Spanish. My daughter would like to have different music selections available while I would love to have a volume control. We are out at the campground in a small camper and “Elmer” tends to speak very loudly in the mornings when others are sleeping. The “BrushyBall” is large and easy for small hands to use. We have had times where they have accidently bumped the ball and the head closed. My kids had to start all over from the beginning and weren’t very happy about that. The top of the head has space for two toothbrushes. I find it difficult to clean the holders. It also locks the head down unless you remove both toothbrushes at the same time. The “BrushyBall” is a great tool that makes tooth brushing a fun activity and encourages children properly brush their teeth. I love that he guides them through every step of the process, even including brushing their tongue, which is a spot my children often forget! He’s fun, upbeat and encouraging a great addition to any morning/night routine. For more information on the “BrushyBall – The Toothbrush Coach” visit them on their website, twitter, facebook, and pinterest. *Disclosure: I was provided with a complimentary “BrushyBall – The Toothbrush Coach” in exchange for my review. All opinions are 100% my own.